There’s no doubt 2014 was another big board-gaming year for me. What I’d thought about as an obsession has just become the norm, but I’m comfortable with that. I’m loving and contributing to the hobby, so who cares? It’s a brilliant community and I’m proud to be part of it. Paros: Our second trip to board gaming paradise to this beautiful Greek island was very different to our first, but I found it equally enjoyable. 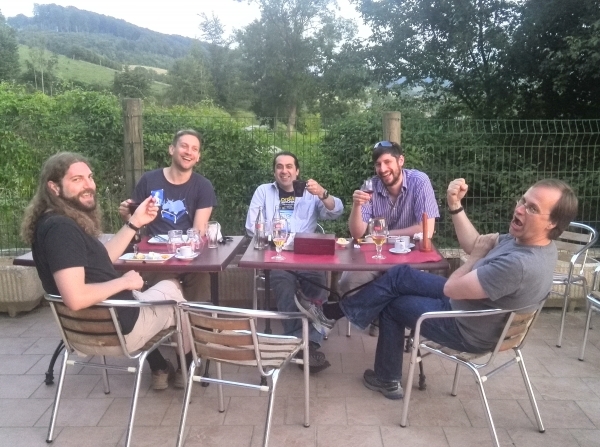 There wasn’t the same sense of adventure and exploration, while some bad news leading to an absentee made it a little sombre, but t the same time we totally relaxed and just swam, gamed and ate/drank. Our hosts were again amazing, we played 20+ games (many off of my ‘to play’ wishlist) and I really hope we can go back again – hopefully in 2016. Essen: I’ve written plenty about my third trip to Essen in previous posts, so won’t say much here. I certainly hope to get some kind of pass (press/exhibitor) again in future as it was a major advantage in traversing crowds; and with the promise of the Empire Engine German edition in 2015 I’ve already got my hotel booked for next year! I won’t stay beyond the Sunday though – it proved a bit much, even for me. Oxford: Empire Engine also gave me, Zoe and Matt an excuse to go to Oxford for a weekend to try and promote the game at the UK’s premier board game cafe, Thirsty Meeples. While we didn’t do much with the game, it was Zoe and my first proper touristy trip to Oxford, which was lovely, and the cafe was amazing. We’ll definitely be back to both, hopefully next year some time. France: LoB buddy Tom invited a group of fellow gamers to stay at his family’s cottage in the south of France for a few days of country air and gaming – and lovely it was too. I ended up playing 36 games in four days, which included plenty of breaks for great food, booze and a lovely walk to find a TV and watch some World Cup footie. Would be great to do this again one day soon (if you’re reading Tom…). Home and away: While I failed to get much game evangelising in this year, we did at least have some really nice weekends of gaming with like-minded gaming couples – namely Karl & Ann and Paul & Donna. This proved to be a lovely blend of walking, boozing, eating and gaming both in St Ives and London and are they very much on the agenda for 2015. I only wish I’d thought about things earlier and arranged something for New Year’s Eve – again, it’s firmly in my mind for the end of next year. Eastbourne: Once again, my two trips to Eastbourne for gaming weekends-on-sea with the London on board regulars were great fun. Zoe only came to the Easter one this year, leaving me to fend for myself in November. Both were great in different ways and I think the plan is now set for following Eastbourne trips, as long as we keep getting invited. St Ives Board Game Group: While Zoe and me have enjoyed our first full year in St Ives, we haven’t exactly integrated into the community. Generally it’s your typical town and people seem to have known each other for years, so while friendly enough it never feels very open. So it was great when this board game group started up and I got to meet some like-minded individuals – and they’re the ‘normal’ kind of folk too, not the weirdy nerdy ones (well, mostly). Long may it continue. January: It’s nice to be reminded how much you like game, and doing this list has brought Manhattan Project back into my mind through all those shiny new Essen releases. Andy, Carl and me had a great close and tense game back in January that I won on 62 points – but both the other guys would’ve won on their next turns. February: It was a year liberally sprinkled with great couply games weekends, but the gaming highlight was a game of Concordia with Ann, Karl and Zoe at ours. I won a wonderfully tight game that saw the four of us separated by just 12 points. March: Sci-fi behemoth Twilight Imperium, bought for Andy’s 50th, took the March crown. I somehow talked people out of beating me to a pulp while sneakily lining a few points up. Just when I thought the game was up I survived another round unmolested and walked into the last territory I needed. It won’t happen again. April: Finally getting my own copy of Brass, getting it to the table, then Zoe enjoying it, was brilliant – but a more typical game of ours stood out: A really close two-player game of Castles of Burgundy on a quiet evening in with a bottle of wine. The new games, the holidays, the get-togethers – all awesome. But that’s what it’s all about. May: Our trip to Paros was lovely, and we played plenty of thinky games, but the stand out experiences were silly games of Cash ‘n’ Guns and Tumblin’ Dice. The former was purely daft fun, while the latter shows that it’s not impossible for me to be good at the occasional dexterity game. June: Another title was knocked off my ‘classics I need to play’ list in Manhattan – a beautifully nasty and stripped down area control abstract that was the first board game in ages I demanded back-to-back goes at after loving it the first time. Honourable mention to outdoor game Molki, which I bought after falling in love with. 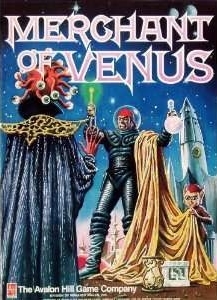 July: I’d wanted to play Lords of Vegas for years – and when I finally did, it blew my mind. I played against two seasoned vets (Martin and Rocky) who showed me the depth the game can go to; I was purely along for the ride. Luckily both helped me along, I’m sure to their own ends, but Martin won out. And a mention for a great game of Letters to Whitechapel at the St Ives Board Game Group, where we failed miserably to capture a very sneaky Dan but had great fun trying. August: Two great début experiences, with Formula D just beating off Dead of Winter for top spot. I was down and out going into the big final corner, second last of seven. But as it transpired I was the only player who could get into the outside lane and had luckily got the gears just right, letting me sling shot around the outside for an unlikely win. Shake and bake! September: The beauty of Ra is its unpredictability – and September saw the perfect example. I had a strong looking tile set going into the last round, but not much could make it better. I grabbed things early but thought the time left would let Carl and Andy prosper – only to see a crazy string of Ra tiles scupper them both. October: Essen and Eastbourne – what a month and so hard to pick a winner. 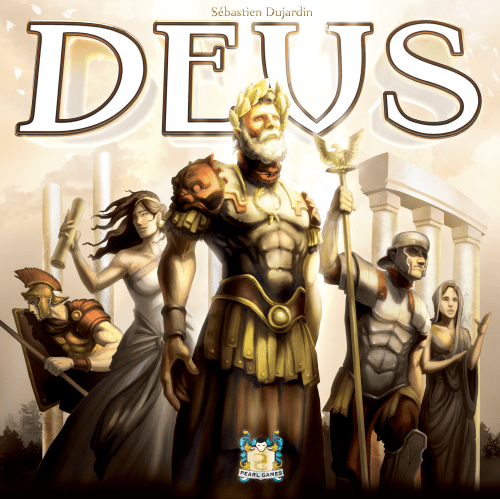 My first games of both Deus and Caverna were amazing, but it was my plays of ebbes and First to Fight that stole the show. Both were played wit the designers, both were both fun and funny, while both were also fantastically entertaining games that I subsequently bought. Absolutely what Essen is all about. November: Two variants of games I’d looked forward to a lot shared November’s prize. Basari: Das Kartenspiel was everything I’d wanted it to be (Basari in a little box while losing nothing), while the finished version of Snowdonia: The Necropolis Railway was everything Zoe and me had helped make it become in testing. Mage Wars with LoB friend Paul was also a very close contender and if I hadn’t been counting the minutes before I’d had to go home, rather than enjoying a relaxing beer, this may have taken it. December: Matt Dunstan does, compared to me, have a big fizzing brain and I think he expects to beat me at any strategy game we play. At Thirsty Meeples in Oxford I taught him and manager John Deus – a game I’d played twice before. Matt started getting pretty smug half way through as the points rolled in, but I had a pretty good engine of my own going. In the final tally I’d beaten him into second by three points and oh boy, was his face a picture. I just wish he’d said, “does not compute” in a robot voice. He was genuinely surprised and yes, sadly enough it made my day. It was another year of experiments, as out of more than 500 total game plays in 2014 more than 130 were games I only played once. When you add more than 100 plays of unpublished prototypes, that’s almost half my plays. While this looks a bit grim for my top titles, lots of my favourite euros games were on or around five plays including Deus, Snowdonia, Bora Bora, Copycat, Terra Mystica and Concordia. With such a big collection, it stands to reason I’m having to spread them thin! But no, it’s not something I’m totally happy with – especially when I look at some of the crap games I was subjected to in 2014! I really don’t think this will look the same next year. I already feel as if I want to spend more time playing the games I really like, while I’ve got a lot of ‘must play’ titles off my wishlist in the last couple of years. I’ve also signed up to the ‘33×3 Challenge‘ on Board Game Geek, which aims to get you to play 33 games 3 times each during 2015. This will hopefully encourage me to get a bunch of my favourites to he table more often. After 10 plays of Kingdom Builder in 2013, I only played twice this year. Lost Valley again failed to hit the table in 2014, while Merchant of Venus and Tikal – two of my favourite new games last year – were played a lot less than I’d predicted. But these are all on the aforementioned ’33×3′ list, so should see some more love this year! Cuba and Earth Reborn had also gone unplayed through 2013 and I’ve since traded Cuba, while Earth Reborn won’t be far behind. They’re both good games, but the former feels too much like work while the latter I simply can’t see myself playing – I’d need a regular partner and that’s simply not going to happen. At least I managed four games of For Sale – I still can’t quite believe I didn’t play it all in 2013. 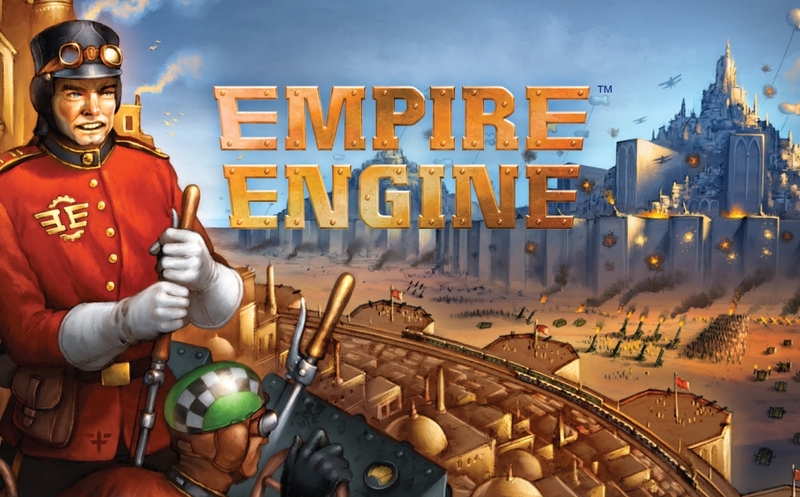 As I mentioned above, the German release of Empire Engine this year already has me excited about next year’s trip back to Essen. It may even arrive in another language or two, which would be amazing. Also, as we’re not off to Paros in 2015, I’m hoping to go to my first UK Games Expo in Birmingham in May – even if only for a day to check it out and maybe give Empire Engine a little push there too. I also have a couple of 2014 prototypes still with publishers, so there’s also the chance follow up may also be at Essen too – but that would probably be too much to ask for! I do intend to stick at designing games though; but I’m not ramping that up at all, as much as I’d like to (although working on an expansion for someone else’s game is a distinct and exciting possibility). It just doesn’t seem financially viable right now. I’m also hoping to leverage the ‘designer’ tag a little, especially in terms of getting myself onto some podcasts in 2015. I have spoken agreements to get on as a guest for two already and if they go well, who knows? Maybe I’ll look to start doing something a little more permanent. I’ve enjoyed radio when I’ve done it in the past, so why not? As for new purchases I really am going to try and rein them in, but when I haven’t I said that? But I may actually keep the promise this year. If nothing else, this year has taught me that I have a lot of awesome games on my shelves that I don’t play enough and that i’d love not to be rubbish at! * For previous entries, see my 2012 and 2013 posts. 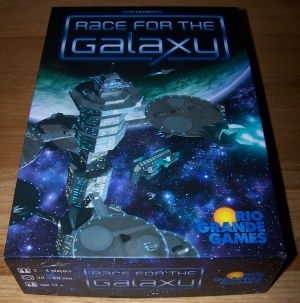 This entry was posted in Board games, Game design, Games and tagged best board games 2014, best card games 2014, Best of 2014, board game, board games, brilliant games, card games, Eastbourne, Essen, Essen 2014, game groups, games, gaming, gaming experiences, London on Board, Matthew Dunstan, travel, UK Games Expo, worst board games 2014 by Chris Marling. Bookmark the permalink. You’ll be very welcome when I get round to fixing a date for the next one. Nice review, and if you’re bringing Tikal to Eastbourne I’ll happily play it because it’s great.